I WANT TO BE AFIRST CLASS KID! At First Class, our mission is to nurture not only the child, but also the family. 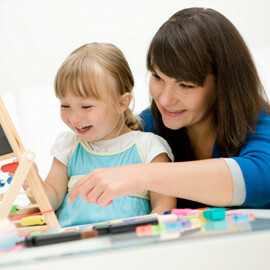 We provide a homelike atmosphere because there is nowhere that a child learns better than at home from their parents. We are fortunate to have dynamic professionals, who are devoted parents who bring their children to our school. Learning Problem Solving Through As Many Senses As Possible. First Class Child Development Center is an academically accredited private school and preschool located in the Clear Lake area of Houston. 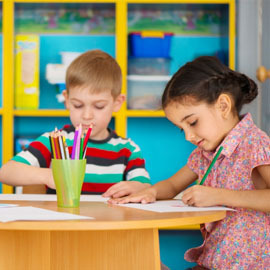 First Class provides a learning environment for children 0-13 years of age, including infants through private kindergarten, as well as afterschool students. First Class offers an academic early learning environment that teaches the whole child including cognitive development as well as social, emotional, and physical development. The mission of First Class is to nurture not only the children, but also the family. Children are taught in a creative environment through hands-on activities in order to assist them in developing problem solving skills. 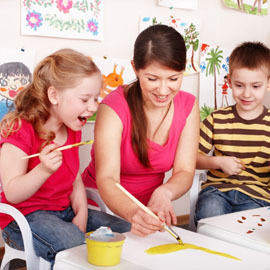 Learning happens through as many senses as possible at First Class Child Development Center.